Oh, radio. The oldest electronic media seems pretty “vintage,” and to some, a relic of a bygone era. But don’t be too quick to toss it out in favor of newer media—it turns out, there’s evidence suggesting that radio outperforms every other medium in return on investment. So, what’s going on? 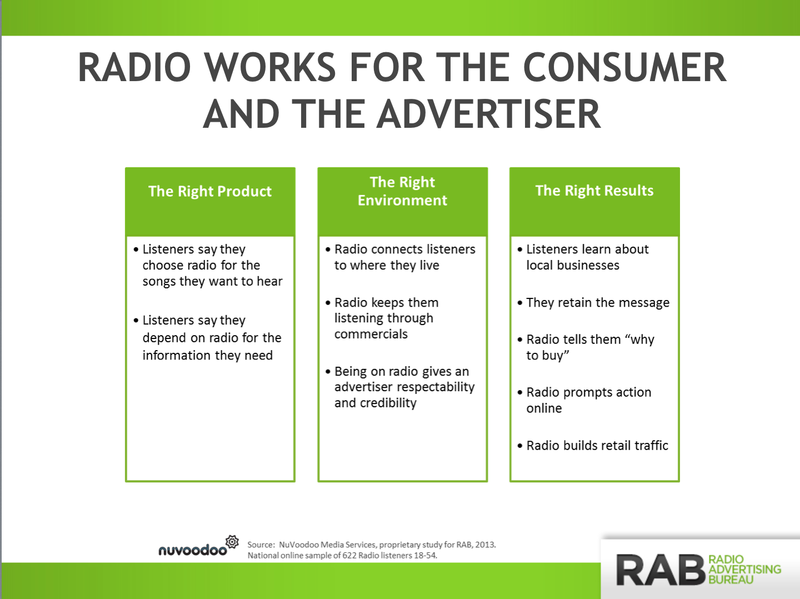 Here’s a look at why marketing dollars invested in radio provide an outstanding ROI, and what you can do to identify if you should add radio to your marketing mix. Radio doesn’t cost listeners; you simply have to be able to pick up a signal in order to use it. As such, it’s the most accessible media source out there. 243 million listeners tune in to the radio every week. In the U.S., that’s 91% of all people age 12 and older. These three best practices of radio advertising will set you up to make sure the money you invest in your radio advertising gives you a solid return. One of the biggest mistakes you can make in radio advertising is not thinking about your target audience. Putting a “one-size-fits-all” commercial together and scheduling it at the cheapest times available won’t get you anywhere. It’s crucial that you think about who you’re marketing to and when they’ll be listening. Entrepreneur.com has some great tips for pinpointing your audience. Once you’ve decided who you’re marketing to, create your spot with that target audience profile in mind. All of those questions are directly related to your potential customers, so make sure you aren’t choosing what to do based on your own preferences. If you don’t know where to start, consider polling people in your target audience to help you figure out your answers. While it could be argued that repeating your phone number or website helps listeners remember the information, it tends to do more harm than good—it’s actually kind of annoying. In his article, My Top 10 Radio Ad Beefs, Paul Suggett makes a good point. If someone you don’t like comes up to you in a bar and gives you their phone number a dozen times, will you call it? No way! On the other hand, if someone is funny, charming, beautiful, or a combination of all three, and they give you their number just once, will you call? Of course. This is about creating interest. Grab your audience members’ attention, and make them want to know more. Worry less about the call-to-action, and more about the “meat” of your radio spot. Use radio to remind your audience about what they already know about your brand and it’s benefits. If you succeed in winning the listener over with your “charm,” they’ll take the necessary action to follow up with your request. In fact, 28% of radio listeners initiate online searches based on something they’ve heard on the radio. That’s a noteworthy number, considering some radio listeners can’t even search online until hours later! The key to success in getting radio ROI (or ROI in any media) is to test, track, adjust, and repeat. If you don’t have a specific call tracking number or a website address unique to your radio ads, you won’t have any idea how your radio marketing is performing. That means you won’t know what it’s costing you per lead or per click, you won’t know whether or not it’s worth it to keep running the ads, and most importantly, you won’t be able to invest wisely to keep your business growing. Analytics are your best friend when it comes to spending your advertising money. For example, once you’ve identified specific stations where you’re getting potential customers, you can segment further by adding specific call tracking numbers or website addresses to different ads at different times of the day. Then, you’ll know which ads perform better. The possibilities are endless, and you may be surprised (and delighted) by what you find. By focusing on your target audience and being persuasive but concise with them, you’ll be able to attract the customers you want. Then, by making sure you track every ad, you’ll have a clear picture of how it all fits together and what changes or additions to your radio ad budget you need to make to improve your radio ROI.